Leg Warmers are another prime example of 1980’s fashion, often picked out as evidence of the bad fashion trends that the decade is remembered for. Â I say “bad” because when you look at many films or TV shows made during the 1980’s you often can’t draw your eyes away from what the actors are wearing, rather than paying attention to the plot. Â At the time these trends were anything but bad! So what is a Leg Warmer? Â Well, imagine a long pair of knitted socks that could reach over your knees when fully pulled up. Â Now remove the foot part of the sock and finish that end off with elastic in the same way you would do with the top. Â Leg Warmers can then be worn on the lower leg only, from just below the knees to just above the ankles, left baggy around the calf area. Why were these so popular then? Â Well, I can only assume it must be down to the popularity of films and TV shows about dancers, such as Dirty Dancing or Fame. Â Many dancers, especially ballerinas, where these to keep their leg muscles toasty once they have warmed them up in order to prevent injury, hence why movies were full of people wearing them. Â People liked the look, so started wearing them in normal life. Remember I referred to the idea of “bad” fashion. 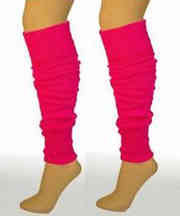 Â Well, I guess what I mean by this is that some fashions can be made to look bad, and Leg Warmers are a prime example. Â A pair of plain coloured Leg Warmers on a ballet dancer looks fine, but a pair worn over jeans in vivid neon pink looks, well, slightly bizarre? This entry is filed under Fashion	and was posted on January 8th, 2009. You can follow any responses to this entry through the RSS 2.0 feed. You can leave a response, or trackback from your own site. One of those hideous trends, like shoulder pads, that have been threatening to come back on and off for a couple of years and get seen occasionally on young fashion victims. I swear I’ve seen these worn with high heels. They weren’t very flattering first time round, unless you were a dancer (and yes, films about dancing are back too). I USED TO WEAR KNEE WARMERS BACK IN 1979. I HAVE HUGE KNEES.